Supernatural is back and so are Bobby and Rufus! 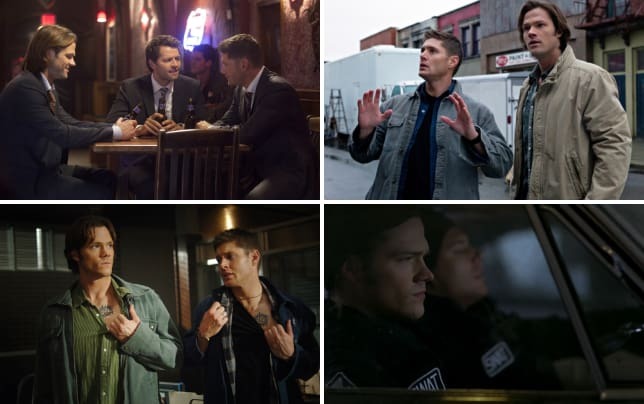 Supernatural Season 11 Episode 16 brought the “Grumpy Old Men” back in a clever way that mixed with Sam and Dean’s soul eater case. But did we just get a glimpse at a possible spin-off? What are you waiting for? It’s time for the Supernatural Round Table. Christine: I loved Bobby asking Rufus if he was ever nice, and Rufus said, "1985. Worst year of my life." I always forget how much I enjoy Rufus until he's back. And I really liked the re-use of rock, paper, scissors game with Sam and Dean. I never want that gag to end because it's just so brotherly and perfect for them. Nightsky: I’m a sucker for the tug at heart strings, so my favorite scene was Dean seeing Bobby at the top of the staircase. My favorite quote was Sam simply saying, “I’ve got you,” while protectively holding Dean. The entire episode was breathtaking, though. The absolutely flawless switching between Rufus/Bobby and Sam/Dean was technically and emotionally inspired. Alice: Wow, I’m not sure I had a favorite scene. It was just consistently good from beginning to end. Christine took my favorite quote so… I’ll just go with every scene and every line. Sean: Yeah, this turned out to be a fantastic episode. There was so much to like. But I have to agree with that Rufus quote, “Nineteen eighty-five. Worst year of my life.” So funny. Did you enjoy seeing Rufus and Bobby again? Christine: So much. So, so much. I think what I liked most about it was that it wasn't Heaven and they weren't ghosts. The parallel story worked so well. It never felt like a flashback either. The direction and editing was completely on point. Nightsky: YESSSSS! The writing and direction of the entire episode made it feel like we never lost Bobby! I agree with Christine that they didn’t look like flashbacks at all. It felt like “old times,” and we were seeing an episode that easily could have been filmed 6 years ago and just shown now. Credit must go to Jim Beaver and Steven Williams for picking up their characters so seamlessly. Alice: Oh, hell yes! I’ve said it numerous times, I’ll say it again. I’ll never never never never ever never forgive the powers that be for killing off Bobby. Having said that, the chemistry between those two working a case was again wildly entertaining. The whole idea behind the story was perfect. Robbie Thompson told us in Chicago last year that he wanted to do a Rufus and Bobby story, and I’m thrilled he was able to do it. He delivered big time. Sean: I’ll admit I was worried by their return, but it was such a pleasant surprise how it turned out. Bobby and Rufus were great and entertaining together, and using a past case to showcase them was the right move. Plus, it blended so well with the present case. And I’m so glad they weren’t ghosts. Was the soul eater a creepy monster of the week? Christine: I don't know if it was creepy, but it was one of their better ones this season. I think the souls in the house were more creepy, to be honest. Nightsky: It wasn’t so much the monster as the “horror film” tactics. I was really freaked out in a few spots! Supernatural Season 11 is scarier to me than any of the prior years. Alice: Very much so. I think it’s one of the best monsters of the week we’ve gotten in a long time. Given how much this show likes to mess with souls, I’m surprised we haven’t had one before now. Plus, the whole concept about the soul eater living in an other dimension where time wasn’t relevant was a great brain twister! I wouldn’t mind running into this one again. Sean: It was creepy for sure, and I agree that the souls added to that. There was such an anticipation to see this character that not showing it, using sounds, atmosphere, enhanced the tension and dread. Really liked this monster of the week. Should we be worried about a major character getting killed off this season? Christine: We should always be worried about anyone who isn't Sam or Dean being killed off. If you had asked me that a few years ago, I would have said that they'd never kill Bobby, and they did, so I can't think anyone who isn't a Winchester is safe anymore. Nightsky: While Sam or Dean certainly might die, we know they’ll come back. I’d bet my bottom dollar they won’t kill off Cas because of Misha’s huge fan following. It makes the most sense for how his character has been positioned, but it makes no sense thematically or practically. Even though I haven’t seen anything that makes me suspect they’re positioning Mark to leave the series, he would be the only one that might be in danger. Still, I don’t think so. Alice: You mean Sam? The signs all seem to point to him. Yes and no. You can’t kill a main lead, so it’s not like he’s going anywhere. But I really would love to see him struggling in the after life for a bit, exposing some of those unknowns that fans have been speculating for years. The idea of “the empty” intrigues me. 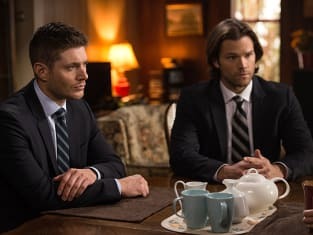 Since Dean has an in with the sister of God, I’m thinking he’ll have some pull in getting Sam back. But, I have serious doubts the show is bold enough to go there. Sean: I really don’t think it can be Sam or Dean. I felt like with Castiel’s decision to let Lucifer in he might be the one to sacrifice himself or something in the end. I just don’t know with Supernatural, but we are heading into the 12th season, so who knows? Would you watch a spin-off with Bobby and Rufus or is there another Supernatural spin-off you'd want to see more? Christine: I'd love a prequel spinoff of all of the old hunters. I think it would be a lot of fun to see Bobby, Rufus, Ellen, and anyone else they met along the way. They're all such great personalities that I think they could definitely carry a show of their own. Nightsky: I adore Jim Beaver and Bobby, but frankly, no, I wouldn’t want that spin-off. It’s just too close to Sam and Dean’s story. I’d keep wanting to see what they were doing (even if they were just children during his prime hunting years). I think the spin-off has to be with female hunters. I think a brilliant idea would be Woman of Letters, Delphine Seydoux. We could see the Men of Letters in the bunker at the height of their power, the backdrop would be World War II, they could pull in the Judah Initiative’s fight against the Nazi’s. It’s perfect. Alice: This is the best execution I’ve seen for a potential spin-off so far on Supernatural. I think they’ve finally found the best idea. I’m so ready for more Rufus and Bobby stories. However, any Supernatural spin-off right now should only run for six to eight weeks when the show goes on break, a la Agent Carter subbing for Agents of S.H.I.E.L.D. I don’t think the “Grumpy Old Men of Letters” concept could carry a whole 23 episode season. Sean: If you’re going to do a Supernatural spin-off it would be with Bobby and Rufus. The episode just showed how engaging and interesting them working the case would be. That said, I agree, it would probably work best as like a mini-series or something.